The underwater relief is a great unknown. Although it seems strange, in the XXI century we know better the topography of some Martian places than the one of almost three quarters of our own planet. From the shore we can not see what is hidden under the water, nor can we empty the sea to access the bottom. For this reason, the study of marine depths, called bathymetry, is addressed indirectly through the use of echo sounders. These devices emit acoustic waves towards the bottom, time how long they take to return to the surface and transform the time into depth values. They allow to obtain many bathymetric data, but they are complex instruments that require boats capable of long navigation. The sea is vast, sometimes incomprehensible. Despite the efforts of recent years, we have barely surveyed 5% of the total ocean floor. But what we have been discovering reveals that the underwater relief is far from uniform or boring. Moreover, we often come across an amazing and rugged topography. On the seabed there are great mountain ranges, extensive plains, deep hollows and steep valleys. Like their terrestrial counterparts, these reliefs evolve in response to a series of geological processes. In the center of almost all the oceans we find the mid-oceanic ridges, which rise up to 3,000 meters above the adjacent bottoms. These underwater elevations cover a total length of 80,000 km and cover about 23% of the planet’s surface. They constitute, by far, the largest mountain chain on Earth. 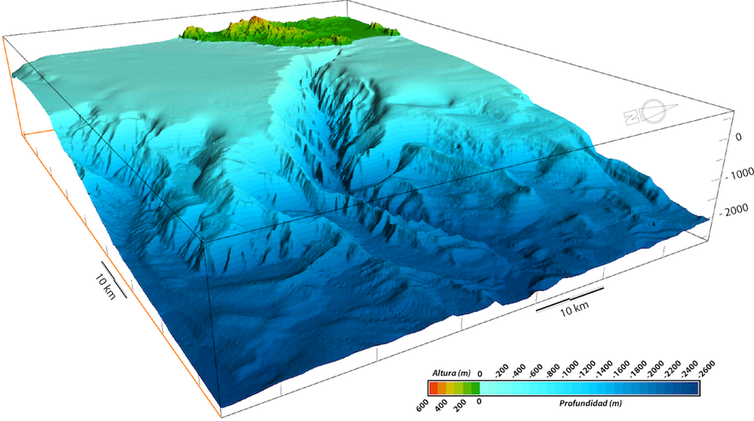 Between the ridges and the continental areas, at depths between 3,000 and 6,000 meters, the abyssal plains are located. These vast and monotonous regions of hundreds of km², the final destination of many oceanic sediments, are almost flat. The most developed occupy a good part of the Atlantic ocean floor. The continental margins are the seabed adjacent to the continents and occupy 28% of the area covered by the sea. Because of its proximity, and because of the economic importance of many of the resources it houses, it is the best known part of the underwater relief. There are two main types of continental margins. Those with little seismic activity are known as passive margins. They are formed by accumulations of sediments from the erosion of the continents. They can extend hundreds of kilometers and are located, mainly, in the coastal zones that surround the Indian and Atlantic oceans. On the other hand, active margins have greater seismic activity. They present a minor sedimentary development and are located mainly in the Pacific Ocean. A distinctive feature is the presence of a narrow groove known as the oceanic pit. The ocean trenches are one of the most spectacular topographic features on Earth. They can be thousands of kilometers long and very deep. 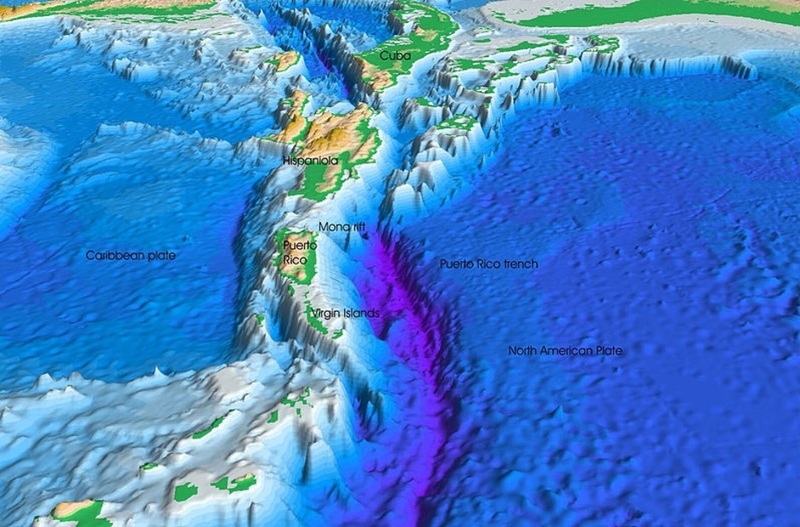 The Marianas Trench, located in the western Philippines, is over 11,000 meters deep. It is the deepest place on the planet. Among the most outstanding reliefs dotting the seabed are the underwater valleys. These are classified according to the type, intensity and duration of the processes that generate them and keep them active. We can find from furrows of glacial origin in polar latitudes to deep channels that meander the seabed in the vicinity of large fluvial mouths. The long, sinuous and embedded valleys that cut much of the continental margins are called submarine canyons. These erosive reliefs act as conduits: they transfer sediment, organic matter, waste and pollutants from the coastal areas to the deep parts of the ocean basins. Its distribution is global, with more than 5,800 guns counted. Their sizes are comparable to those of the great terrestrial cannons. But some, located in the Bering Sea between Siberia and Alaska, are gigantic and exceed 100 km in width, 400 km in length and 2 km of difference between the edge and the bottom. We do not have to go so far to trip over these reliefs. Much of the Catalan margin is cut by deep and long canyons whose dimensions exceed those of any nearby land valley. A couple of them attract attention. The Blanes canyon, near the mouth of the Tordera river, is the largest and most complex of the entire margin. Its layout is winding, especially in the lower sections, and exceeds 150 km in length. In some sections of the upper course the width exceeds 20 km. Farther north, on the Costa Brava, the imposing Palamós canyon begins its journey almost touching the coastal cliffs and sinks to travel about 110 km. In its superior course presents very steep slopes, a width of 16 km and a difference of more than 1 km. The canyons of the Catalan margin are also preferred transport routes for the material that comes from the continent. Many studies highlight the important role they play in oceanographic dynamics and in the processes that control the functioning of marine ecosystems in the area. Thus, the relative abundance of food found there and its environmental conditions favor the proliferation of some marine species, some of them of great fishing interest. This makes them very rich in biodiversity. Why study the underwater relief? The detailed knowledge of the submarine relief helps to improve the exploitation of the marine living resources. Bathymetric maps also improve the safety of navigation. Other applications include littoral management issues, such as the protection of marine habitats and the regeneration of beaches. Also of coastal engineering, such as the installation of infrastructures and the construction of ports. Even for the location of resources such as oil and gas. The bathymetric surveys, finally, help scientists to improve the interpretation of studies related to climate change, the historical evolution of the coastline and the propagation and incidence of tsunamis. There is still much to be recognized, especially in detail. We will have to redouble our efforts. I trust that next summer, lying on the shore again, remember and appreciate that there lies under the sea a special landscape that deserves to be explored.